More Liberalism – More Prosperity? 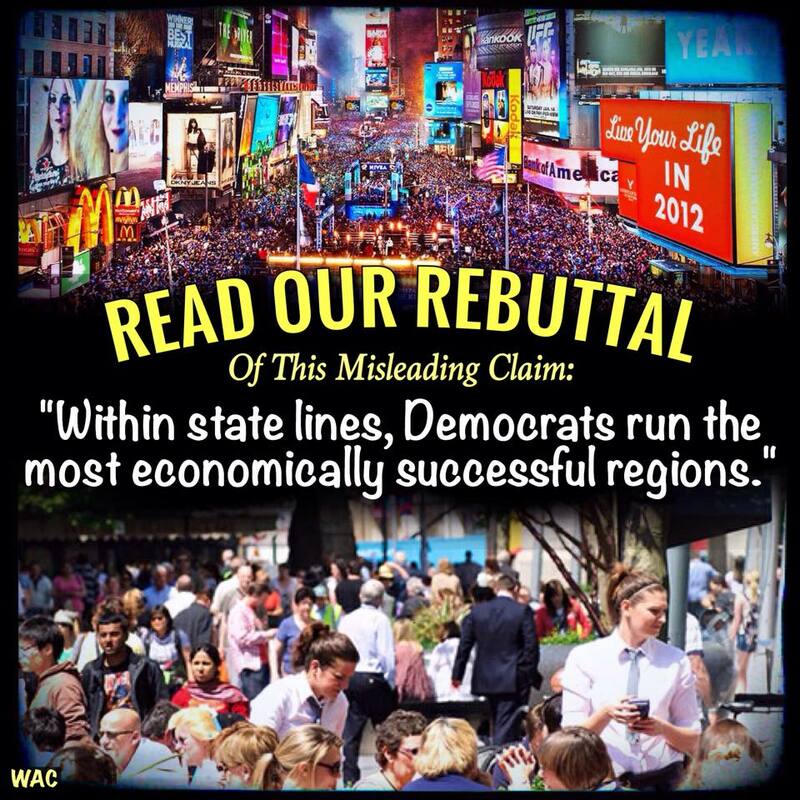 The Misleading Claim: Within state lines, Democrats run the most economically successful regions. Clearly, their policies must be superior! In every major election, we’re confronted with colorful maps showing small but densely populated areas of blue lost in a sea of rural red. This, it would seem, lends credence to those who claim Democrats manage modern and successful economies, such as cities, while Republicans are mostly relegated to backwards, old-fashioned, small towns. But it’s more complex than that. What’s true is that Democrats run the 10 most dangerous cities in the country. [a] [b] And per a Brookings Institute study, Democrats also control 9 of the 10 worst offending cities in terms of income inequality [c] They run the 10 poorest cities in America [d], and have run every other major city in America that turned into “a center of poverty.” [e] [f] What’s ALSO true, however, is that they run most of the SUCCESSFUL cities as well. So what’s going on here? Are they doing a good job of managing the economy or a bad one? It turns out, Democrats don’t just run good cities or bad cities, they happen to run almost ALL of our cities, good AND bad. Matter of fact, Democrats “currently control city hall in 90 percent of the nation’s largest cities.” [g] That’s why they can turn up anywhere in the statistics, whether they be good statistics or bad ones. And that’s why it’s technically true for them to claim that they run the most successful regions. But let’s examine how this circumstance came to be. 1. There has been a gradual exodus from cities by conservative voters. 2. Cities are, by nature, almost always more economically successful than their rural neighbors, regardless of the local politics and in spite of which party is running them. The cause of this exodus seems to be a fascinating link between preferences over population density and party ideology. “There’s a self-selection for people that choose to reside at higher density,” says Robert Lang, an urban affairs professor at the University of Nevada. [j] In an analysis of voting data from the 2012 presidential election, it was found that “98% of the 50 most dense counties voted for Obama and 98% of the 50 least dense counties voted for Romney.” [k] Further analysis showed there existed a crossover point (800 people per square mile) where population density above said point had Americans voting majority Democrat and below said point had them voting majority Republican. Specifically, when below 800 people per square mile, there is approximately a 66% chance that someone will vote Republican. When above 800 people per square mile, there is approximately a 66% chance that someone will vote Democrat. [k] Of course, it’s not ONLY that certain types of people are attracted to denser areas. “Once there, they have a greater demand for infrastructure, including public transportation. That makes them more responsive to pro-government positions — and the party that embraces them.” [j] But never the less, density appears to be the strongest factor influencing the exodus of conservative-minded voters who prefer the less congested residential neighborhoods of surrounding suburbs, while commuting into the city only to work, or entirely abandoning the city altogether and living solely in rural areas. This is the great characteristic of cities. They allow a populace to concentrate commerce in one commercial sector while enjoying it (from a distance) back home, outside the city. You get the benefit of the corporate job that came with the expanding city-economy without necessarily having to live next to the undesirable skyscraper, factory, or parking garage, etc. This is the symbiotic relationship of cities and suburbs, and it’s partly why conservative mind-sets, who particularly value the so-called “American Dream” of having a home, a back yard, cars, and an opportunity to send their kids to higher performing schools, take up residence in the suburbs as opposed to the city. Meanwhile, the city, on paper, is where the job was created and where the commerce took place. Cities, as confirmed by a 2012 Credit Suisse report on urban development, generally have better per-capita GDP’s than rural areas. [L] This fact has to do with the nature of cities. Consider, for instance, the effects of commercial zoning laws. A sky scraper can employ thousands of people in dozens of offices. Had it not been a sky scraper, however, and instead been an ordinary 2 floor office building, that same acreage of land would have had much lower potential, with the capacity only to employ a few dozen people and attract far fewer corporate tenants. Urban zoning allows for the skyscraper and therefore attracts economic investment that wouldn’t necessarily be welcome in suburbs or small towns. Population density and other factors correlate strongly with a trichotomy in residential preference, contributing to the regional political divides found in the United States. The result is Democrat heavy urban areas, Republican heavy rural areas, and a blend of each found in the suburbs. Couple this with the fact that urban areas, despite some notable exceptions, have inherently superior per-capita GDP’s and higher rates of productivity, and you see how people can misinterpret the data and suggest progressive policies had resulted in economic achievement. Rather, cities are successful because they are skill abundant, can scale up to focus on specialized tasks and create jobs which otherwise would lack sufficient demand to exist, can fit more people, businesses, and careers in smaller spaces, can deliver more packages, if domestically, can deliver them with less fuel and in less time, and most importantly, cities generally exist near hubs of trade and transportation, keeping them commercially attractive even in the face of burdensome taxation. THESE are the reasons why economic growth occurs in urban areas. Democrats, on the other hand, merely haven’t moved away from urban areas at the same rate as conservatives, resulting in the disproportionate demographics we see today. That doesn’t mean Democrats get to claim credit for the successes of cities, however.